Late last year I was excited to be asked by Wahaca to curate an arts programme for their new temporary space at London’s Southbank – the initial phase of which is about to happen as part of the Festival of the World. It’s been a pleasure to be able to invite two artists I am passionate about – Saner from Mexico City and the French artist Remed who is based in Madrid, for this first round of mural painting. Both of these artists have featured in my Street Art Sketchbook series and are artists I’ve built relationships with through other projects in the past. 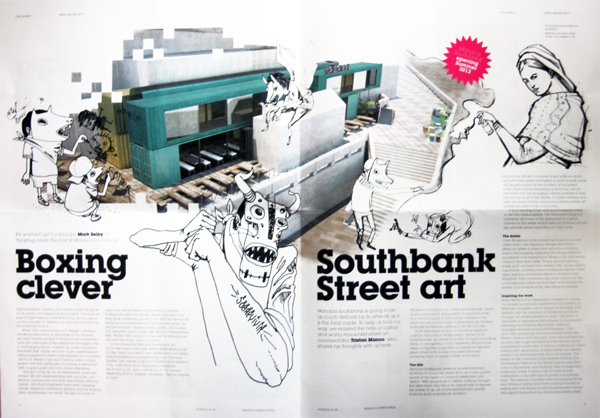 I felt that their work would be a great match for what Wahaca is trying to achieve – which is to showcase the best of world street art in and around its temporary restaurant space, while linking and supporting the year-round arts events at the Southbank. The restaurant design is in itself an experiment, constructed using empty sea containers, which the artists Saner and Remed were particularly attracted to, alongside the public nature of the murals and the theme of the arts festival, which is ‘Art for Social Change’. Saner’s participation was key for me, his work is so alive and vibrant and he’s not had the opportunity to paint to this extent in the UK before. 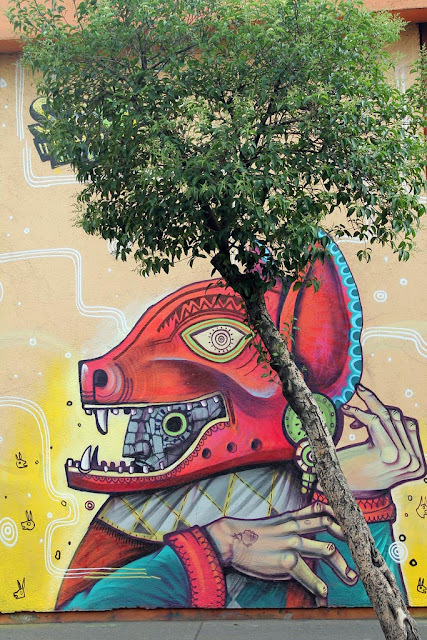 He is also a great representation of the young street art and graffiti art scene that is flourishing in Mexico at the moment. His work, which references Mexican folklore and culture does so in a way that is completely original and avoids cliches. He manages to explore all kinds of folkloric narratives which can be very powerful but he does so with a lightness of touch and humour. I can’t wait to see what he produces. 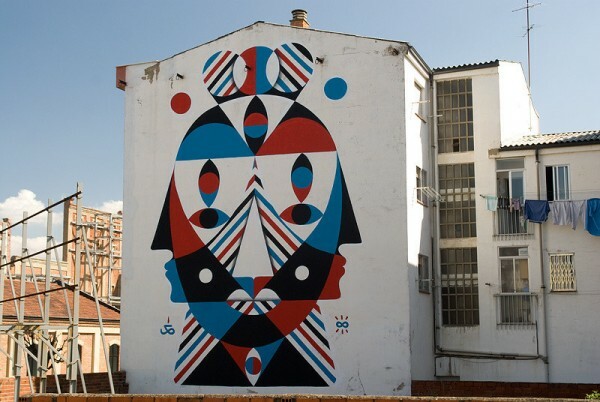 Similarly Remed has visited the UK before but has not had the exposure that a public mural project at the Southbank should achieve – so I’m hoping his work will also be greatly admired. I find Remed’s work to be very strong, bold and beautiful. Inspired by Modernism and modernist painters such as Ferdinand Leger – his paintings have a great sense of form and balance. Every shape, curve and colour is carefully considered and plays off each other. Often using figures or typography his works are filled with personal narratives and symbolism. There is a great recent interview with him here. Remed was only able to confirm recently so doesn’t appear in the Ola London article. 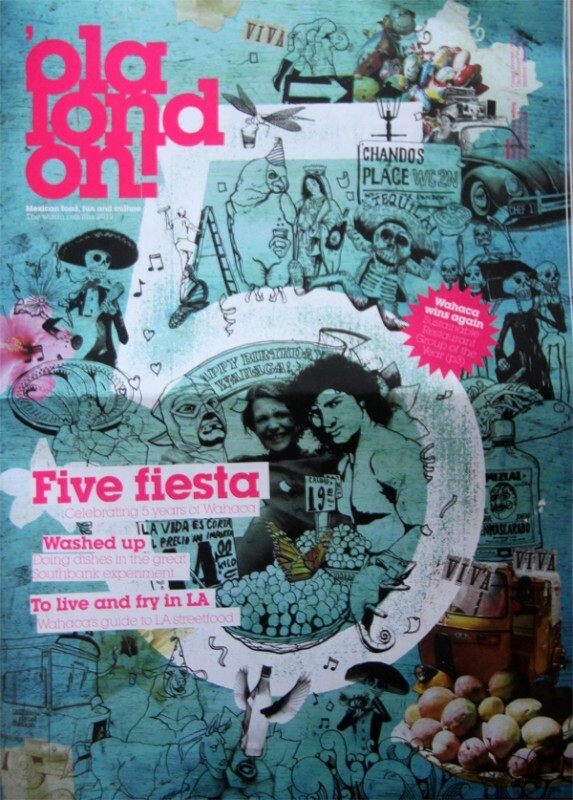 This project has been under-wraps for some time (cue some terrible pun about Quesadillas) – and finally its out of the bag with an article published in Wahaca’s Ola free newspaper (which I contributed to). You can see how it develops on Wahaca’s blog and I will post further news and info on my own blog here.